Just the restaurant for a classic, chic seduction. 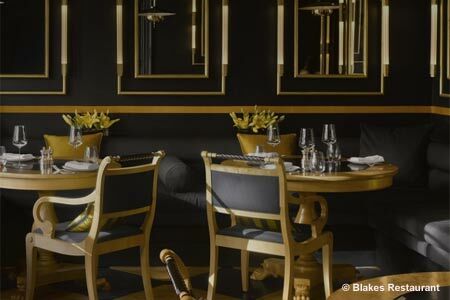 : Blakes Hotel, famous for its stunning bedrooms and design from the glamorous Anouska Hempel, also has a restaurant, which is just as much an experience in the world of fantasy. Not surprisingly, it’s a celebrity haunt; with such high prices, it’s not a place for ordinary mortals and luxury is the name of the game. The menu offers a mix of classics --- oak-smoked Scottish salmon, inkfish risotto, and Asian-inspired items as in miso soup with tofu or char-grilled tuna on lotus crisps. Mains tend more to the exotic. Try sea bass with soba noodles in a soy and ginger broth, chicken teriyaki with stir-fried pak choi, or come down to earth with a simple rack of lamb with rosemary. The presentation is as attractive as the clientele, who, despite their slender figures, manage to sneak in one of the desserts. Service is attentive; the wine list memorably expensive.